One of my favorite aspects of Alice’s Adventures in Wonderland is the many different ways it can be interpreted. Some people view it as a coming of age story while others might see it as the story of a mentally ill (definitely amnesiac, possibly schizophrenic), drug-addled lunatic who can’t tell the difference between reality and fantasy. Phoebe in Wonderland (2008) is a movie adaptation of Alice in Wonderland starring Elle Fanning as a young girl learning to deal with Tourette’s syndrome (a neuropsychiatric disorder that is characterized by physical or vocal ‘tics’ such facial movements or outbursts of obscene words). The adults around her do not know how to help her with her behavioral issues, and her mother is uncomfortable and frightened of burdening/labeling her daughter with the stigma of a mental illness. Phoebe eventually works through things with much imagination and participation a school production of Alice in Wonderland. I think this movie is very interesting because it combines bits from both ends of the spectrum of interpretation (navigating childhood, struggling with a mental disorder). In particular it reminded me of our discussion in class the other day about photographs of women in asylums and ‘Ophelia types’–women suffering from melancholia or depression. These photographs were meant to show how mental and psychiatric illnesses were written upon the body. We viewed a selection of photographs by Julia Margaret Cameron and Dr. Hugh Welch Diamond of which two in particular stuck with me. 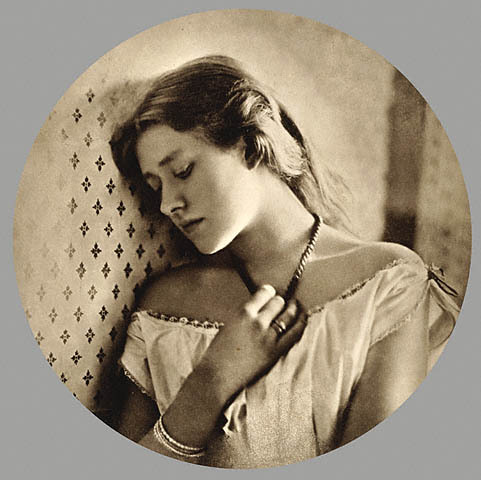 This first one is by Dr. Diamond–he photographed women in asylums, often dressing them as Ophelia to represent their illness. 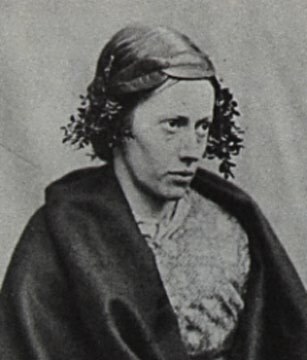 This second photograph is by Julia Cameron of her maid. It is titled ‘The Echo’, referring to the tragic greek myth about a nymph who was cursed to only be able to repeat what others said. In both these images, the women represented are presented as sufferers of melancholia, which manifests itself through their physical appearance, especially in their wild hair and strange dress. During the Victorian era, a woman’s unbound hair could signify sexuality gone astray or madness. 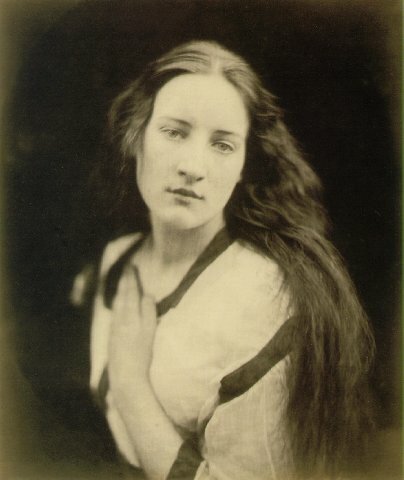 So I find it interesting that John Tenniel chose to illustrate Alice with long, wild hair, which is very reminiscent of many of Julia Margaret Cameron’s women. Granted, unbound hair in children was probably more of a symbol of innocence. 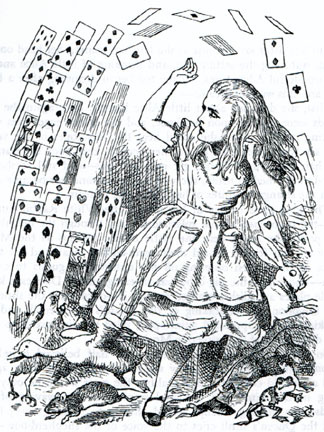 But I think it’s important to note that Lewis Carroll was not very happy with John Tenniel’s final portrayal of Alice–Lewis Carroll felt that the drawings should have been more childlike and innocent and less womanly. I love the connection you make between Alice’s long locks and the usual depictions of wild-haired women as, well…wild. Pheobe in Wonderland is also a great find, and a great intersection in the depictions of children and female madness. Alice is relieved of her social responisbilities, even as a child (to act demure and obey adults) and it must be a great movie to see a child who so clearly does not fit into the ‘norm’, express herself in Wonderland, even if just on a school stage. I do think that Carrell’s dislike of Tenniel’s drawings must have had something to do with Alice’s woman-ness and sexuality. I also agree that this had something to do with her wild hair. However, it seems to conform with the norm of that time: disobeying women (and children) are portrayed as mad. Or innosence, innosence on wild display, which is itself a threatening demonstration. In some way, Alice in Wonderland reveals the power of childhood which is otherwise ignored and stopped in the real, everday life.